I am behind the trash times, people, I hope you’ll forgive the lag in posts and subsequent flood. 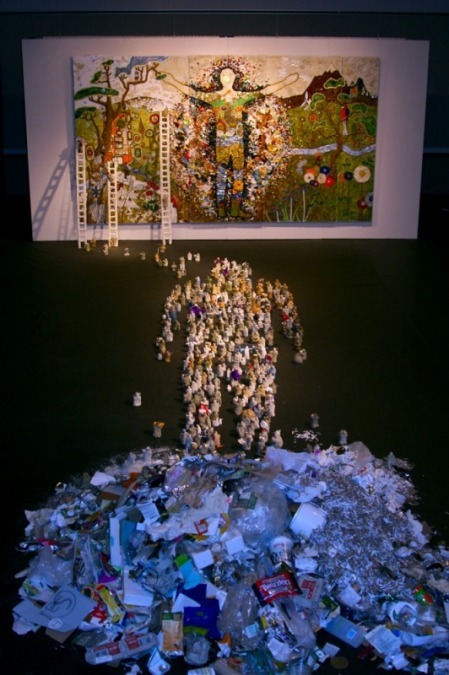 During the hiatus, an exciting thing happened, trash artist Kuros Zahedi finished his long-awaited installation “Finding Away” using the trash blogger Ari Derfel collected over the course of one year. Here’s a snap, courtesy of the artist. Look out for it at the Green Festival in San Francisco in November. More images available here. Kudos, Kuros! It looks great. This entry was posted on Friday, September 25, 2009 at 11:30 am and is filed under Artistic Trash. You can follow any responses to this entry through the RSS 2.0 feed. You can leave a response, or trackback from your own site.